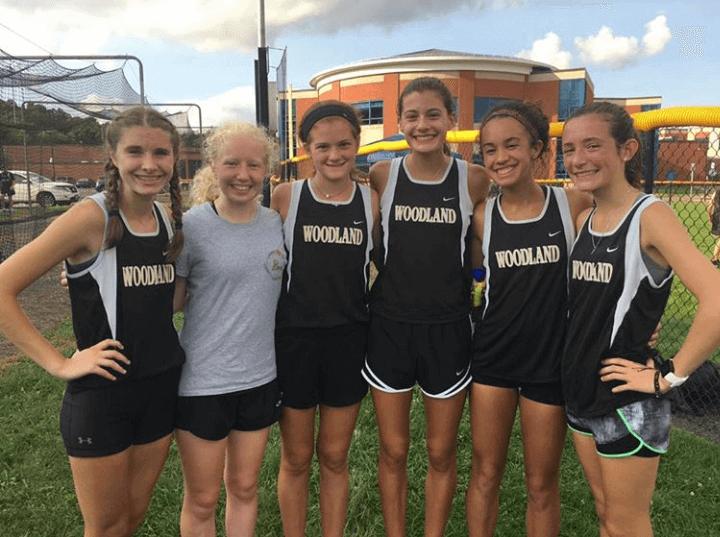 In their second meet of the season, Woodland Cross Country won by pushing themselves their hardest, battling the heat, humidity, and slippery conditions throughout the race. Both the boys and the girls focused on running together during the race and keeping a close group, which made them successful by the end of the race. Sophomore, Jaden Young won the girls race with the time of 20:21. Young was able to preserve her energy throughout the race in order to have a strong finish. Junior, Emma Slavin ran with Young throughout the race and she had a time of 20:25. Junior, Calisa Costanzo, and freshman, Chloe Poulos finished the race within seconds of Slavin. Costanzo came in at 20:32 with Poulos right beside her at 20:33. As Young said, the girls formed a strong pact during the race, which helped them to win. Junior, Jill Brotherton, and sophomore, Brooke Iannone, were also significant runners throughout the race. Brotherton ran 21:28 with Iannone close at 22:22. In the boy’s race, freshman, Chase Young, won the race with an astonishing time of 17:31. Despite slipping and falling, Young was able to recover himself and keep up with the other boys. Senior, Greg Aldrich was only seconds behind with a time of 17:34. The boys were followed by closely behind by senior Kyle Crowell, who had a time of 17:45. Sophomore, Martin Swercewski ran a 18:04 alongside freshman, Colin Slavin who was only seconds behind him at 18:05. Woodland Cross Country is starting the season strong, with a 5-0 record. Their next meet will be at home on Tuesday, October 2.